Among the many leaders I have studied — presidential candidates as well as foreign adversaries as a consultant to the U.S. military — Barack Obama is something of a rarity. First, Obama seems almost uniquely free of “psychological warts”; his personality profile is as smooth as his eloquence on the podium. Second, with the exception of Nelson Mandela and Bill Bradley, who unsuccessfully challenged Al Gore for the 2000 Democratic nomination, Obama is the only high-level leader I’ve studied — foreign or domestic — who can truly be called a conciliator. 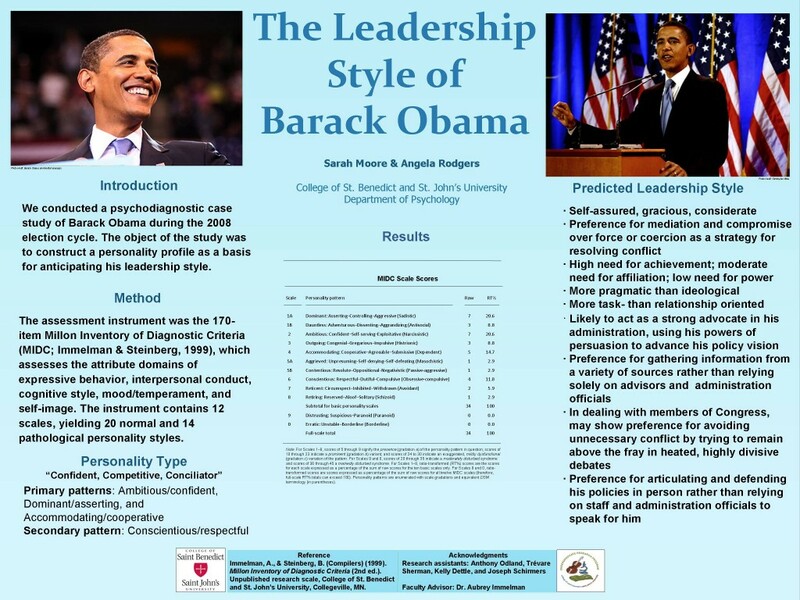 Taken together, three studies I’ve conducted since 2007 with student research collaborators in the Unit for the Study of Personality in Politics at the College of St. Benedict and St. John’s University reveal Obama as an ambitious, self-confident, modestly dominant leader who is outgoing, congenial, and accommodating. Obama’s combination of confidence, dominance, and congeniality fits the profile of a charismatic leader. Psychologically, Obama’s self-confidence and congeniality are qualities at the heart of his exceptional ability to inspire followers, articulate a vision, and connect with people. However, it’s also a double-edged sword, for those are the very qualities that also suggest a president — like Bill Clinton — overly concerned with self-validation and the need for affirmation. In office, the executive performance of confident, ambitious leaders like Obama, who is only modestly dominant, is driven by four core qualities: power, pragmatism, ideology, and self-validation. Because of their strong belief in their own skills and talents, consolidating their power is an important driver for their leadership behavior but, because they are not driven by a naked quest for power, they favor pragmatism as a strategy for achieving success. However, because of the extraordinary confidence leaders like Obama have in their own ideas and potential for success, their pragmatism may be tempered by strong idealism and an ideology-driven desire to transform society. A notable (though not central) aspect of Obama’s personality is that, among presidential candidates I have studied since 1996, Obama is one of the few that can be labeled conscientious or deliberative — a trait he shares with former presidential candidates Al Gore and Mitt Romney. This suggests that as president he will be attentive to detail and well equipped to appreciate the long-term implications of his policy objectives. For voters looking for a new, more thoughtful direction in presidential policymaking, that would be a plus. That brings me to the Bradley effect. No, not former Los Angeles mayor Tom Bradley — an African-American who lost the 1982 California gubernatorial race despite being ahead in the polls going into the election — but 2000 Democratic presidential hopeful Bill Bradley. As noted above, Obama is the only leader I’ve profiled who is substantially accommodating, agreeable, and conciliatory. That’s nice, but we live in a dangerous world and accommodating leaders have a tendency to be conflict-averse. For voters, the key question should not so much be whether Obama has the right stuff to move the nation in the right direction, but whether he has what it takes to prevail in the dog-eat-dog world of international politics. Accommodating personalities like Obama have a strong need to reconcile differences and are able to concede when necessary. But that begs the question, When is it really necessary to make concessions? On the other side of the coin, cordiality and compromise characterize accommodating leaders; they are respectful and gracious, even with adversaries and people that they don’t like very much. That tendency could be significant on the domestic front to change the tone in Washington, something President Bush promised but failed to deliver. With his unique amalgam of ambition, charisma, and agreeableness (what I call a “confident conciliator”), Obama has the capacity to maneuver his way skillfully in Washington, to seek consensus, and to break the gridlock — assuming his idealism does not get in the way of pragmatic necessity. So, as the clock runs down to the day of decision on Tuesday, the question for undecided voters should no longer be “Who is Barack Obama?” but whether Obama is tough enough to pull the trigger unflinchingly in — God forbid — the event it becomes a necessity to secure America’s vital national security interests in a post-9/11 world. A slightly edited version of this article was published under the title “Sen. Barack Obama: Is he tough enough?” as part of a special election feature, “Who Are These Candidates,” in the St. Cloud Times (p. 7B), November 1, 2008.